It feels really good to be a Pakistani woman these days. 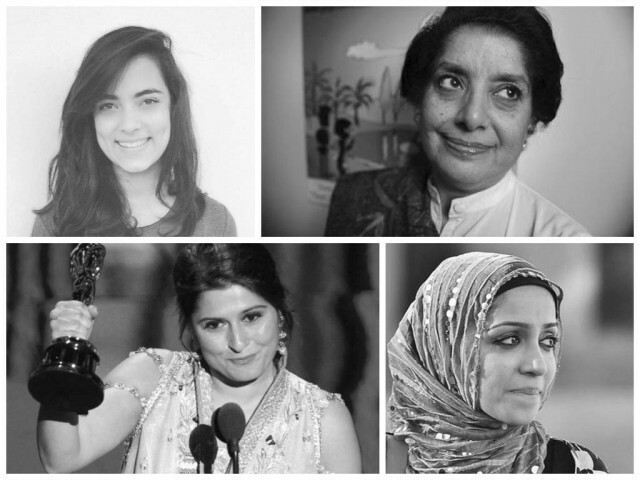 It brings a big smile to my face when I see five Pakistani women in the list of BBC’s 100 women of 2014. And no matter how controversial one may call Malala’s Nobel Peace Prize, there is no denying the fact that it has brought Pakistani women at the centre stage again. Yes, the world is often quick to assume that women in our country are weaklings – damsels in perpetual distress. For a very long time the west has considered them little more than slaves of their male counterparts. Their assumptions are based on certain facts we unfortunately cannot deny. The Global Gender Gap Report has pushed Pakistan to the second last position in the world in terms of gender equality. But is that the complete truth? There are stories that this Gender Gap Report won’t tell and yet these stories exist because of this very gender inequality in Pakistan. Our women have proved, time and time again, that they simply do not give up in the face of any opposition. Not too long ago, they stood along men to demand independence from the British rule; they have continued to stand up to demand their own freedom in the independent state of Pakistan. Here are a few of the many incredible stories worth remembering today. But she defied the four-wall prison and much more when she climbed up the Civil Secretariat Lahore during protests in 1947 and pulled down the Union Jack to proudly hoist the flag of Muslim League on the building. It was a remarkable thing to do. She was only fourteen at that time and she probably did not realise the symbolic importance of what she had done. Pakistani women would climb over barriers, buildings and even mountains to push the boundaries of their own emancipation for decades to come. Women activists during Ziaul Haq’s era. Fast forward to Ziaul Haq’s regime – a time of great tumult in the lives of Pakistani women. They are being told that if they are sexually assaulted or raped they would require four male witnesses to prove the crime in the court of law. They were also being informed that from now onward the evidence of two women would be equal to that of one man. Pakistani women did not sit in the four walls of their houses on hearing this. They could see a shadow falling on the future of their daughters to live safely in the land of the pure and they would not sit quiet. Outraged, they came out on the streets to protest. They were baton charged but did not give up. This was the time women emancipation campaign gained strength in the country. We see prominent activists, like sisters Hina Jilani and Asma Jahangir, emerge out of this chaos and help create organisations like Human Rights Commission of Pakistan (HRCP) and Women’s Action Forum (WAF). Work done by female activists in this era became a blueprint for future feminist movements in the country. Women empowerment and education go hand in hand but education is a dangerous thing. It makes us aware of our surroundings and our place in the world. It nurtures a questioning mind and uplifts the spirit that seeks freedom and justice and equality. Therefore, imparting quality education to masses – especially those living in the rural areas of Pakistan – has remained extremely difficult. In the past, women have been deprived of education more than men because they are not seen as bread winners for the family and education is largely seen as means to get work. By taking the right to education away from our girls we have also snatched their right to justice and freedom. One of the first schools for Muslim girls was founded in 1895 by Amina Tayabji and was a result of Sir Syed Ahmed Khan’s bold campaigning for education for Muslims. Later, in 1906 Begum of Bhopal, the female ruler of the princely state of Bhopal opened an exclusive girls’ school in Aligarh. Today this is a cause close to Malala Yousafzai’s heart and while she is on the forefront, we should not forget that, thankfully, she is not alone in her struggle. There are girls like Humaira Bachal, fighting for the right of education in Pakistan every day. Bachal was the first woman from her family to receive an education despite the opposition from community elders and even her own father in the little Mawach Goth in Karachi. At an impressionable age of 12, she began teaching underprivileged children in her neighbourhood. This practice became what is now Dream Model Street School. She has received many international awards for her struggle and achievements including Women of Impact Award at the Fourth Annual Women of the World Summit in 2013. Then there is Begum Jan, a doctor who grew up in South Waziristan and attended a boys school because there was no school for girls in her village. She is the founder of Tribal Women Welfare Association, which not only educates tribal women about their rights but also gives them basic medical education. She was the first Pakistani woman to receive the International Women of Courage Award in 2008. While we are speaking of courage, let’s talk about a certain Zaibun Nissa Hamidullah. She was the first female English language columnist and political commentator in Pakistan but left the paper when reprimanded for her political commentary. She launched Mirror – a monthly publication, which became critical of Iskandar Mirza’s rule and was later banned. A famous street in the heart of Karachi, Zaibunnisa Street, is named after her. She has inspired hundreds of women reporters, editors, publishers and storytellers to join her tribe. Stand back and look at Pakistan’s literary scene. There is an array of female writers of both poetry and prose who have most eloquently conveyed the struggles of Pakistani women in their writings. We have Ismat Chughtai, Quratulain Haider, Zahida Hina, Bano Qudsiya, Fehmida Riaz, Ada Jafri and Parveen Shakir to name a few in Urdu literature. Shaista Suhrawardy Ikramullah and later Bapsi Sidhwa were trailblazers for dynamic writers of English fiction like Sara Suleri, Kamila Shamsie and Uzma Aslam Khan. Today, there are many prominent female directors, photographers, and artists magnificently shaping the visual culture of Pakistan. In recent years the unstoppable Sharmeen Obaid Chinoy has captured the stories of previously unseen Pakistani change-makers in her camera and has mesmerised the world with her storytelling. Then we have women laying the groundwork for development in impoverished regions of the country. One of them is Dr Quratulain Bakhteari who spent the formative years of her life living in a refugee camp in Karachi after the partition. She was a young mother of three kids by the age of 22 but managed to complete her Masters degree from the University of Karachi and later completed her Doctorate from Loughborough University in England. Today she is the founding director of the Institute For Development Studies and Peace (IDSP) – a training ground for young change-makers from underprivileged communities. She has been working for the development of rural communities and girls’ education in Balochistan and was nominated for the Nobel Peace Prize in 2006. And when we talk about community work, may we never forget the resilient Parween Rehman who assumed the helm of The Orangi Pilot Project in 1999 and helped empower over 113 settlements in Orangi by providing the residents with right training and guidance with a belief that people are their own best resource. She was assassinated while returning from work after receiving several threats to her life for her work. Just last year we saw a new tribe of change-makers emerge in Swat Valley. International media reported with great interest the formation of an all female jirga as a reaction to the normal male jirgas. The story made headlines when Jan Bano took the case of her deceased daughter, Tahira, to the female jirga, after rejecting a verdict given by a local, typically all-male jirga on her daughter’s death. Young Tahira died after spending 14 days in agony when her husband, Subha Khan, threw acid on her. The police refused to register the case. Local jirga decided that one of Khan’s sisters should be married in Tahira’s family to compensate for her loss but by this time Jan Bano already had enough of the jirga’s misogynous approach to justice. She had heard about the all-women jirga and approached it for help. While critiques may see jirgas – either men’s or women’s – to be fundamentally flawed for they exist parallel to the existing law of the land, it is reassuring to see women especially in the more conservative tribal areas of Pakistan standing up for themselves. Surprisingly, reports suggest that many local men are supportive of the female jirga for they too have seen the injustice in male-dominated verdicts in the past. It would only be fair then to give Pakistani men due credit. Just as all Pakistani women are not damsels in distress, not all Pakistani men are tyrants and abusers. There are men fully aware of the rights and place of women and who have supported women emancipation in their homes and social circles over the past several decades. There are perhaps just not enough of them yet. So when we talk about Mukhtar Mai, let’s not forget it was a local cleric who encouraged her family to file a case with the police against the injustice of the local jirga and when we talk about Malala, let us also remember it was her father who first encouraged her to take up the cause of education seriously. The women who have not found support from men in their lives have turned the very opposition into their strength. They have achieved what they have achieved not because they are women but because they have refused to believe that being a woman in Pakistan puts them at a disadvantage. They have exercised their right of choice and in doing so have shown great courage and strength. Unfortunately there is no scale to measure courage. We cannot measure how our first female fighter pilot Ayesha Farooq has inspired young Pakistani women. She said in an interview that after losing her father as a child, she grew up to become a young soldier in her family. I wish we could count how many more young soldiers live amongst us, hidden from public recognition. We all know women amongst us working to support their families, multitasking like mad to make sure their houses remain spotlessly clean, and the food is ready and their are families happy. There are courageous women who speak up against domestic violence and abuse even if it means a breach of their private life. There are daring women who take up a career of their choice and marry the man of their choice even if it means they will be shunned from the family forever. Brave women who are making all the choices in their lives, demanding that they be counted and treated like independent human beings and nothing less. On the other side of the scale, suffering will continue. Honour killings, domestic violence and forced marriages will not disappear magically but these atrocities do not define the future of Pakistani women. Be it Fatima Sughra who hoisted the Muslim League flag on the Civil Secretariat in Lahore in 1947 or Samina Baig who unfurled the flag of Pakistan on Mount Everest in 2013, women of Pakistan are telling the world to acknowledge them for what they do and what they are capable of doing. Nothing can stop them from conquering their own fears as well as new horizons they have found beyond the four walls of their houses. Most of women who have stood up for their rights in Pakistan have been hurt. By hurt I do not mean only physical violence, I also include marginalization and character assassination. The women you mentioned in this blog also face the same dilemma. Two of them were shot, one killed, one raped, one marginalized despite winning an oscar and one of them is facing hurdles even setting up an institute. The minorities (Hindus, Sikhs, Christians, Ahmadis) of Pakistan have not fought back. They are just being pushed out. People do not always have the ability or the temperament to fight back. your description makes the women seem not like damsels in distress but vicims of misogyny. Damsels in distress refers to women who make no effort to improve their situation whereas what you are describing is that the elite status quo misogynists have so far been successful in keeping down all women who have tried to break out. Again all the more reason they SHOULD be financially independent. Being financially dependent when you have kids pretty effectively makes it imany more times difficult to get out of an ugly marriage if your spouse is the one who is the oppressor. Again, I know we have discussed tis elsewhere. It seems clear you support fair treatment for women. In light of that, I hope you can review your prejudice against working mother and change ot to prejudice against neglectful mothers – working or not. Well I said before. I am not against women working if they take care of kids. yes, I did not like that. Perhaps it is only a personal point of view. Sorry I was unclear. I was not trying to separate women based on their religion. Rather I was reponding to your statement that ‘remember nything that you constantly put down will stand up. And fight back’. My point was that not all groups that are put down have either the temparement or the capacity to fight back. It is in that context that i brought up the fact that Christians, Hindu, Sikhs, Ahmadis in Pakistan are not fighting back in any way though they are constantly out down.